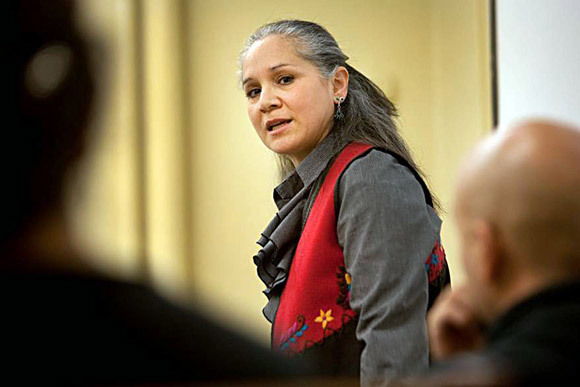 Margo Tamez has been invited by the United Nations Office of the High Commissioner for Human Rights to present research findings on the impacts of militarization on Indigenous peoples, their lands and territories on international borders. An assistant professor of Indigenous Studies and Gender-Women's Studies in the Irving K. Barber School of Arts and Sciences at UBC's Okanagan campus, Tamez will present during the 5th Session of the Expert Mechanism on the Rights of Indigenous Peoples (EMRIP), held July 9 to 13 in Geneva, Switzerland. EMRIP provides the Human Rights Council with thematic advice, in the form of studies and research, on the rights of Indigenous peoples. "Being selected to participate is an enormous honour," says Tamez. "It comes with a significant responsibility to uphold the principles of Indigenous elders, women, families, youth and workers in regions of North America which have been brutally marginalized in U.S. domestic policy decisions related to border security." In May, Tamez and research collaborator Ariel Dulitzky, clinical professor of law and director of the Human Rights Clinic at the University of Texas, submitted a study to the UN Committee on the Elimination of Racial Discrimination (CERD) related to human rights violations impacting Indigenous peoples on the Texas-Mexico border in connection with the U.S. border wall. Tamez plans to inform the EMRIP of this ground-breaking study, which highlights the severity of the detrimental social, economic, and political impacts of border militarization and Indigenous land dispossession directly tied to the construction of the Texas-Mexico border wall across the lands of the Kickapoo, Tigua, and Lipan Apache Indigenous communities. The 5th Session of EMRIP will bring together representatives from states, Indigenous Peoples, Indigenous Peoples’ organizations, civil society, inter-governmental organizations and academia. High on the agenda is the global importance of the implementation of the UN Declaration on the Rights of Indigenous Peoples at the country level within nation-states and a knowledge exchange about the challenges Indigenous peoples face in achieving this internationally recognized goal. "I am thrilled to have the chance to work in collaboration with some of the world’s top experts and innovators in Indigenous rights and social movements," says Tamez. "I look forward to learning more about high-level UN internal mechanisms, as well as gaining deeper understandings of Indigenous women’s roles as researchers, community advocates and international diplomats."